Bed and Breakfasts near Russells Personal Water Craft for 1 night from Thu Apr 25, 2019 to Fri Apr 26, 2019 within 25 miles, in an Average Nightly price range of £1 to £200. Situated within the rural village of Moulton, The Poplars provides 4-star, award-winning accommodation within a 300-year old stone building with seasonal dining and cooked breakfasts, 15 minutes' drive from Northampton. With individual, modern decoration, rooms at The Poplars offer free Wi-Fi, TVs, hospitality trays, hairdryers, and complimentary mineral water. Guests can enjoy full English breakfasts made with locally sourced produce, along with a cold buffet. Evening meals are also available 4 nights a week from Monday to Thursday, excluding public holidays. The Poplars provides free parking to guests, and Northampton Railway Station is 15 minutes' drive away. Cottesbrooke Hall and Gardens is 20 minutes away by car, and Rockingham Castle Estate is a 30-minute drive away The Poplars is within easy reach of the centre of Northampton, and conveniently situated for visits to the many local attractions. It is an ideal location for Moulton Park and Round Spinney Business Park. The Poplars has a range of rooms to suit all budgets. Located on a privately owned aerodrome, this unique 3-star hotel is set in a 1930s building and offers a bar, a restaurant, free Wi-Fi and free parking. All the bedrooms at The Aviator have a bathroom with a bath, a shower and a hairdryer. They are well equipped with tea/coffee making facilities, TVs and seating areas. The bar has an extensive selection of ales and other drinks as well as snacks and the restaurant offers an Ã la carte menu; guests can sit at the terrace or in the garden during warmer months. The Aviator Hotel is just 10 miles from the centre of Northampton and 4 miles from the centre of Wellingborough. The French Partridge Country House Hotel situated in Horton Northamptonshire is a contemporary fine dining restaurant and hotel serving locally sourced produce in historic surroundings dating back to the 16th century. The French Partridge is a contemporary Fine Dining Restaurant and Boutique Hotel serving locally sourced produce in historic surroundings dating back to the 16th century. br / br / br / br / Originally a Coaching Inn the hotel now offers luxury accommodation in 10 rooms which include family suites. Set in rural Northamptonshire The French Partridge boasts beautiful scenery with ample parking space and modern conveniences such as Wifi for our hotel guests. br / br / br / br / Open seven days a week 12-3pm for Lunch and 6-10pm for Dinner the restaurant offers a range of cuisines. Our increasingly popular Tapas menu complements our continental A la Carte menu perfectly while we serve a traditional roast on Sunday afternoons. br / br / Please note pets are not permitted and check-in is between 14.00-21.00 daily. br / br / br / br / THE WEDDINGS br / br / French Partridge is fully licensed for Civil Marriages allowing the flexibility of holding your whole wedding day under one roof. br / br / Experience the tranquility and elegance of our garden which provide a beautiful background for your photographs whatever time of year. br / br / br / br / THE CORPORATE EVENTS br / br / We can also host other events such as small or large conferences with our Private Dining Area or Main Restaurant available. br / br / Just contact us and we will tailor-make your events around your needs. We will provide all Audio-Visual equipment and stationary from projectors to flip-charts. br / br / br / br / THE HOLISTIC SPA br / br / br / br / For more information please go to our Contact Us section. br / br / Alternatively Follow us on Twitter or like our Facebook Page. br / br / Thank you for visiting our website we hope to welcome you to French Partridge very soon! br / br / br / br / To ensure that we provide the highest levels of service we reserve the right to refuse check in to any person at any time for any reason deemed appropriate by us including (but not limited to): intoxication or any conduct that we consider would offend or disturb other Guests. Set on private grounds in the rural village of Horton and dating back to the late 16th century, this boutique-style hotel has an award-winning restaurant, a bar, free Wi-Fi and free parking. Each room at The New French Partridge has en suite facilities with bathrobes and a hairdryer, and some have both a bath and a shower. Guests also get in-room ironing facilities. The French Partridge restaurant offers an Ã -la-carte menu, including tapas and traditional dishes with a modern twist. Guests can also choose to relax with a drink in the bar. The New French Partridge Hotel is a 15-minute drive from Northampton and a 5-minute drive from Salcey Forest. Junction 15 of the M1 is a 15-minute drive away, and Northampton town centre can be reached in 10 minutes by car. Luton Airport is a 45-minute drive away. Just off the A45/A46/A509, less than 2 miles from the town centre and just 2 miles from Wellingborough railway station, the hotel offers free parking and en suite rooms. With good access to the area's main roads, the Ibis Wellingborough has a convenient location for some of the region's major annual events, such as Santa Pod drag racing, the Silverstone Formula 1 Grand Prix and the Northampton Festival. There are numerous pubs and restaurants nearby and the hotel has its own on-site bar, serving snacks 24 hours a day. All of the en suite rooms have TVs and internet access is available at an additional cost. Reception is open 24 hours a day. Just off the M1, this Hilton hotel has a gym and a swimming pool, 10 minutes' from Northampton town centre. Rooms have 32-inch TVs and work desks, and free parking is available on weekends. Living Well Health Club has a sauna, a spa bath and a steam room. Beauty treatments and massages are also available. Seasons Restaurant serves an international menu, while Court bar has a large seating area and serves bar meals. Caffe Cino offers afternoon tea and snacks. Hilton Northampton Hotel is 12 miles from Silverstone Race Circuit. Luton Airport is a 40-minute drive away. Very clean, smart, comfortable rooms in quiet home. No pets. Children Fri-Sun only. In 13 acres of beautiful, peaceful grounds, Sedgebrook Hall is situated in the pretty village of Chapel Brampton. It has an indoor pool, a gym and modern en suite rooms. 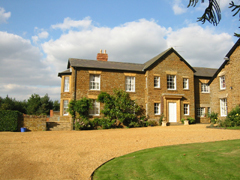 Sedgebrook Hall is a country house just 5 miles from Northampton city centre. The hotel has a superb health and leisure club, including a gym, an all-weather tennis court, a 3-par pitch and putt, and a sauna. Each has luxury bedding, free Wi-Fi, a work desk and a TV. Rooms also feature a laptop safe and tea/coffee facilities. The Tempus Restaurant offers a contemporary dining ambience serving brasserie classics and home-cooked favourites. Dinner may be served in either the Tempus restaurant or bar areas. Sedgebrook Hall is conveniently situated just 8 miles from the M1. Kelmarsh Hall and Gardens is a 15-minute drive away. The nearest rail station is 4 miles away, and Birmingham International Airport is a 40-minute drive from the building. Lamorna Bed & Breakfast provides accommodation with a garden and free WiFi, and is situated in Olney. The accommodation has a hot tub. There is also a kitchenette in some of the units equipped with a microwave. A continental or Full English/Irish breakfast is available daily at the property. The property has a hot tub. A terrace is available for guests at the bed and breakfast to use. Milton Keynes is 16 km from Lamorna Bed & Breakfast, while Northampton is 20 km from the property. The nearest airport is London Luton Airport, 48 km from the accommodation. With a garden and a terrace, The Bull Hotel features accommodation with free WiFi. The bed and breakfast offers a flat-screen TV and a private bathroom with free toiletries, a hair dryer and shower. A continental breakfast is available daily at the property. Milton Keynes is 16 km from The Bull Hotel, while Northampton is 19 km from the property. The nearest airport is London Luton Airport, 47 km from the property.